To enhance the encryption proficiency and encourage the protected multiple images transmission, the current work introduces an encryption algorithm of multiple-image using the combination of mixed image elements (MIES) and two dimensional economic map. Firstly, original images are grouped in one big image, that splits into a lot of pure image elements (PIES); secondly, logistic map is used to shuffle the PIES; thirdly, it is confused with the sequence produced by the two dimensional economic map to get MIES; finally, the MIES is gathered into a big-encrypted image, that splits into a lot of images with the same size of the original images. The proposed algorithm includes huge number key size space and this makes the algorithm save from hackers. Even more the encryption results obtained by the proposed algorithm outperforms existing algorithms in literature. A comparison between proposed algorithm and similar algorithms is made. The analysis of the experimental results and the proposed algorithm shows that the proposed algorithm is efficient and secure. A huge number of images are produced in a lot of fields, such as weather forecasting, military, engineering, medicine, science and personal affairs. So, with the quick improvement of computer devices and Internet, media security turns into a challenge both for industry and the academic research. The image transmission security is our target. Many authors have proposed a lot of single-image encryption algorithms to solve this problem . Single-image encryption algorithms contain algorithm using chaotic economic map , algorithm using a chaotic system , algorithm via one time pads-a chaotic approach , algorithm via pixel shuffling and random key stream , algorithm using chaotic maps and DNA encoding , and algorithm using total chaotic shuffling scheme . In Elsheh and Hamza's work , the authors proposed two secret sharing approaches for 3D models using Blakely and Thien and Lin schemes. Those approaches reduce share sizes and remove redundancies and patterns that may ease image encryption. The authors in Reference  conclude that the dynamic rounds chaotic block cipher can guarantee the security of information transmission and realize the lightweight of the cryptographic algorithm. The single-image can encrypt multiple images repeatedly but the efficiency of that encryption is always unfavorable. Researchers increased their attention towards multiple-image encryption because the high efficiency of secret information transmission is required for the modern multimedia security technology. They have presented many multiple-image algorithms. The authors of , presented multiple-image algorithm via mixed image element and chaos. A multiple-image algorithm using pixel exchanged operation and vector decomposition is proposed in . In , the authors presented an algorithm using mixed permutation and image element. The authors presented multiple-image encryption via computational ghost imaging in . In , the authors proposed an algorithm using optical asymmetric key cryptosystem. Multiple-image encryption algorithm based on spectral cropping and spatial multiplexing is presented in . The authors of  proposed multiple-image encryption algorithm based on lifting wavelet transformed and XOR operation based on compressive ghost imaging scheme. With these large number of proposed algorithms, some practical problems are still existing. For instance, some multiple-image algorithms faced the problem that original images can not be recovery completely . Those algorithms are used to encrypt multiple images, but the corresponding original images are not recovered completely. This leads to lossy algorithms which are not appropriate for those applications needing images with high visible quality. Another problem, the complex computations of some algorithms affect the encryption efficiency . So, good techniques are required for solving these problems . In the current paper, a new efficient multiple-image encryption algorithm using MIES and two dimensional chaotic economic map is proposed. The advantages of that algorithm are recovering plain images completely and Simplifying the computations. Experimental results demonstrate its practicality and high proficiency. S. S. Askar; A. A. Karawia; Ahmad Alshamrani; Image Encryption Algorithm Based on Chaotic Economic Model. Mathematical Problems in Engineering 2015, 2015, 1-10, 10.1155/2015/341729. Sameh S. Askar; Abdelrahman A. Karawia; Fatmah S. Alammar; Cryptographic algorithm based on pixel shuffling and dynamical chaotic economic map. IET Image Processing 2018, 12, 158-167, 10.1049/iet-ipr.2016.0906. Ying-Yu Cao; Chong Fu; An Image Encryption Scheme Based on High Dimension Chaos System. 2008 International Conference on Intelligent Computation Technology and Automation (ICICTA) 2008, October, 104-108, 10.1109/icicta.2008.397. C Jeyamala; S Gopiganesh; G. S Raman; An image encryption scheme based on one time pads A chaotic approach. 2010 Second International conference on Computing, Communication and Networking Technologies 2010, July, 1-6, 10.1109/icccnt.2010.5591643. Sivakumar, T; Venkatesan, R.; Image encryption based on pixel shuffling and random key stream. International Journal of Computer and Information Technology 2014, 3, 1468-1476, https://pdfs.semanticscholar.org/3388/e9f616b21a3b1b5a205c8190ca34419d42c3.pdf. Jian Zhang; Dongxin Fang; Honge Ren; Image Encryption Algorithm Based on DNA Encoding and Chaotic Maps. Mathematical Problems in Engineering 2014, 2014, 1-10, 10.1155/2014/917147. Elaheh Vaferi; Reza Sabbaghi-Nadooshan; A new encryption algorithm for color images based on total chaotic shuffling scheme. Optik-International Journal for Light and Electron Optics 2015, 126, 2474-2480, 10.1016/j.ijleo.2015.06.012. Esam Elsheh; A. Ben Hamza; Secret sharing approaches for 3D object encryption. Expert Systems with Applications 2011, 38(11), 13906-13911, 10.1016/j.eswa.2011.04.197. Juan Wang; Qun Ding; Dynamic Rounds Chaotic Block Cipher Based on Keyword Abstract Extraction. Entropy 2018, 20, 693, 10.3390/e20090693. Xiaoqiang Zhang; Xuesong Wang; Multiple-image encryption algorithm based on mixed image element and chaos. Computers & Electrical Engineering 2017, 62, 401-413, 10.1016/j.compeleceng.2016.12.025. Y. Xiong; C. Quan; C.J. Tay; Multiple image encryption scheme based on pixel exchange operation and vector decomposition. Optics and Lasers in Engineering 2018, 101, 113-121, 10.1016/j.optlaseng.2017.10.010. Xiaoqiang Zhang; Xuesong Wang; Multiple-image encryption algorithm based on mixed image element and permutation. Optics and Lasers in Engineering 2017, 92, 6-16, 10.1016/j.optlaseng.2016.12.005. Jingjing Wu; Zhenwei Xie; Zhengjun Liu; Wei Liu; Yan Zhang; Shutian Liu; Multiple-image encryption based on computational ghost imaging. Optics Communications 2016, 359, 38-43, 10.1016/j.optcom.2015.09.039. Wei Liu; Zhenwei Xie; Zhengjun Liu; Yan Zhang; Shutian Liu; Multiple-image encryption based on optical asymmetric key cryptosystem. Optics Communications 2015, 335, 205-211, 10.1016/j.optcom.2014.09.046. Pingke Deng; Ming Diao; Mingguang Shan; Zhi Zhong; Yabin Zhang; Multiple-image encryption using spectral cropping and spatial multiplexing. Optics Communications 2016, 359, 234-239, 10.1016/j.optcom.2015.09.056. 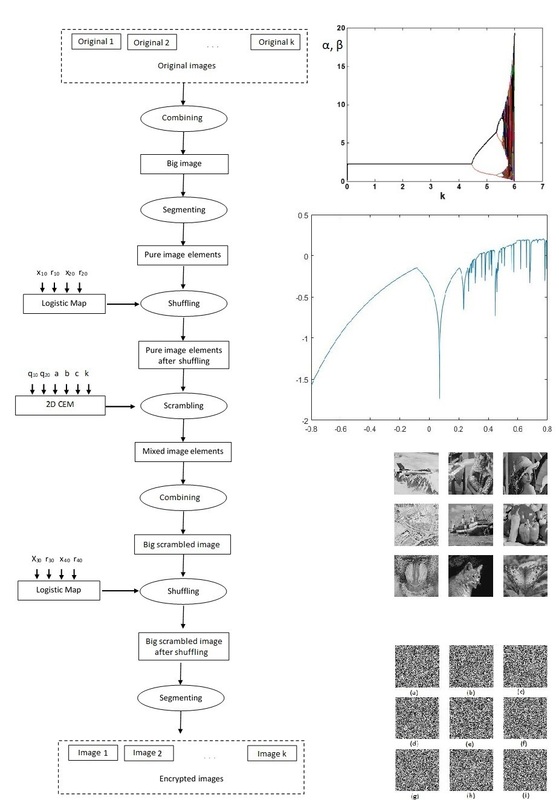 Xianye Li; Xiangfeng Meng; Xiulun Yang; Yurong Wang; Yongkai Yin; Xiang Peng; Wenqi He; Guoyan Dong; Hongyi Chen; Multiple-image encryption via lifting wavelet transform and XOR operation based on compressive ghost imaging scheme. Optics and Lasers in Engineering 2018, 102, 106-111, 10.1016/j.optlaseng.2017.10.023. Tie-Min Mei; Qiu-Hua Lin; Fu-Liang Yin; Hualou Liang; A blind source separation-based method for multiple images encryption. Image and Vision Computing 2008, 26, 788-798, 10.1016/j.imavis.2007.08.017. Qu Wang; Jinyun Zhou; Qing Guo; Double image encryption based on linear blend operation and random phase encoding in fractional Fourier domain. Optics Communications 2012, 285, 4317-4323, 10.1016/j.optcom.2012.07.033. Chun-Lai Li; Hong-Min Li; Fu-Dong Li; Du-Qu Wei; Xuan-Bing Yang; Jing Zhang; Multiple-image encryption by using robust chaotic map in wavelet transform domain. Optik-International Journal for Light and Electron Optics 2018, 171, 277-286, 10.1016/j.ijleo.2018.06.029. Zhenjun Tang; Juan Song; Xianquan Zhang; Ronghai Sun; Multiple-image encryption with bit-plane decomposition and chaotic maps. Optics and Lasers in Engineering 2016, 80, 1-11, 10.1016/j.optlaseng.2015.12.004. Zahra Parvin; Hadi Seyedarabi; Mousa Shamsi; A new secure and sensitive image encryption scheme based on new substitution with chaotic function. Multimedia Tools and Applications 2016, 75, 10631-10648, 10.1007/s11042-014-2115-y. K Abhimanyu Kumar Patro; Bibhudendra Acharya; Secure multi–level permutation operation based multiple colour image encryption. Journal of Information Security and Applications 2018, 40, 111-133, 10.1016/j.jisa.2018.03.006.